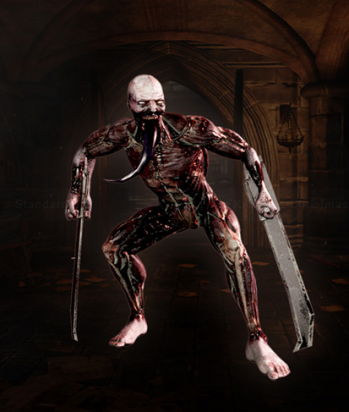 Gorefiends appear as the same as Gorefasts but dark skinned and has a long tongue, wielding 2 large swords wedged in both arms. They are quite durable and fast, while also possessing the ability to spin at a fast rate damaging their fore. They fulfil the role of the damage dealers and for a small line of defence in the specimen line-up. 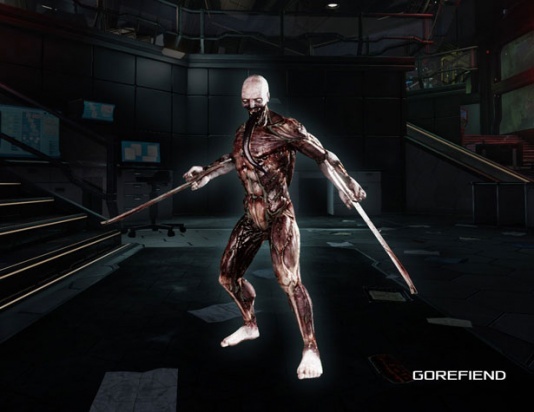 Gorefiends utilize same AI settings as normal Gorefasts and has difficulty-specific odds to spawn instead of their single bladed counterparts. Gorefiends move slowly when docile, and sprint when enraged. Gorefiends will only begin sprinting upon getting close (8m) to players. They do not sprint on sight despite having 100% sprint chance. Gorefiends will sprint once they are shot. Once enraged, Gorefiends will never stop sprinting until they are killed. Gorefiends have a large range of resistances to non-ballistic weaponry. 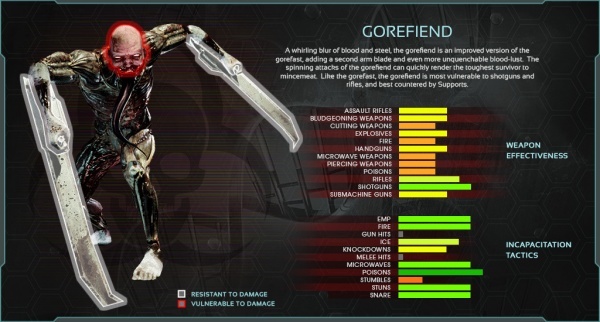 Gorefiends are vulnerable to rifles and assault rifles, but are most notably extremely vulnerable to shotguns. Gorefiends only have one weak spot, which is the head. Their bladed arm deflects attacks. 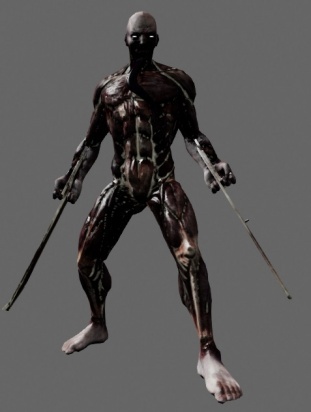 The Gorefiend is muscular, quite light, fast, close-range ZED. 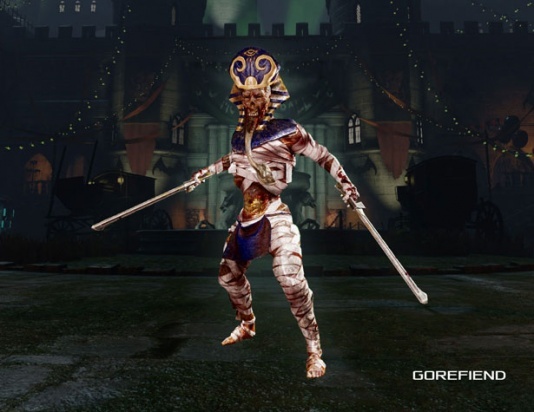 Gorefiends will attack by swinging their swords at players as soon as they get within range. Gorefiends will destroy armor extremely fast, and continues to chip away at armor. Gorefiends can also attack with their swords if players are too close to them. Gorefiends can block gunfire. When shot at, Gorefiends will cross their swords in front of their face to block bullets. When blocking, Gorefiends take 20% less damage, and incapacitating effects are 80% less effective. On Suicidal and Hell On Earth, Gorefiends have a very medium chance to block when shot at.